Dr. Bretz received his DVM degree from the University of California, Davis School of Veterinary Medicine in 2005 and completed a one-year rotating internship in small animal medicine and surgery at Garden State Veterinary Specialists in NJ. He went on to complete a residency in small animal surgery at Tufts University School of Veterinary Medicine and the Angell Animal Medical Center in Boston, MA. Following his residency, he practiced at CARES, a specialty private practice in the northern Philadelphia region before joining PETS. 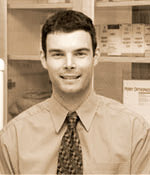 Dr. Bretz is a Diplomate of the American College of Veterinary Surgeons (DACVS). His clinical interests include orthopedic, soft tissue, oncologic, and neurologic surgery. He has also performed multiple types of minimally invasive surgery (arthroscopy, laparoscopy, and thoracoscopy) over the last 9 years and has co-authored several journal articles in peer reviewed journals. He also enjoys lecturing on all aspects of surgery. Brian is currently enrolled in an Executive MBA program at the University of Chicago, Booth School of Business. He lives in Malvern with his wife, a dog and two cats. In his spare time, Brian enjoys running, scuba diving and traveling.